This widely circulated poster of three people watching a baseball game from behind a fence labels the left panel "Equallity" and the right panel "Justice." Above the panels, the poster asserts that the words do not mean the same thing. 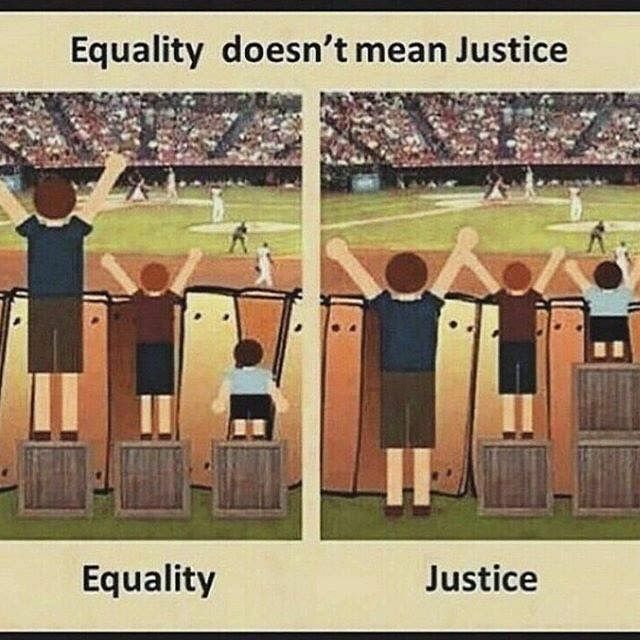 This image could provoke and frame a discussion of political, economic and social issues that turn on our definitions (explicit or implicit) of justice and equality, such as access for the disabled, affirmative action, or progressive taxation. What assumptions do we make about people who are disabled or able-bodied?What do we mean by "accessibility"? How do we make the world accessible?What does justice for all look like, when considering people with disabilities?Why do we label people as "disabled"? What impact does it have?Can there be justice without equality?What is justice? How do we recognize it? What was your first thought on looking at this image? How does the creator of the poster represent equality? How does (s)he see it as different from justice? Do you agree with the tagline "Equality doesn't mean Justice"? Why or why not? Would you describe the figure on the right of the two panels as disadvantaged or disabled? Why or why not? What kind of political or social change might this poster be advocating? Do you find it effective? When you close your eyes and think of the word "Justice," what image comes into your mind? How would you define what justice means to you personally? Does your organization (professional or volunteer) see itself as working for justice? If so, what kind of justice and for whom?